Welcome to this week's edition of Frugal Friday! Can you believe it's December already? Where did this year disappear to?? Okay, enough of my end-of-the-year-only-24-shopping-days-left-til-Christmas-I'm-freaking-out ranting. How about we enjoy some frugal goodness from last week's party, huh? 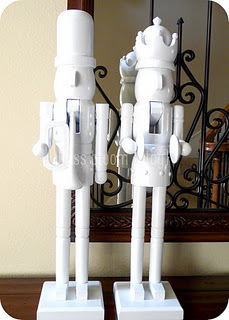 Last week's fan favorite was Bliss Bloom Blog who shared these darling DIY modern nutcrackers. I LOVE this idea!! First up, Suburbs Mama shared her fabulous kitchen redo. I'm in love with the open shelving and subway tiles. So pretty. 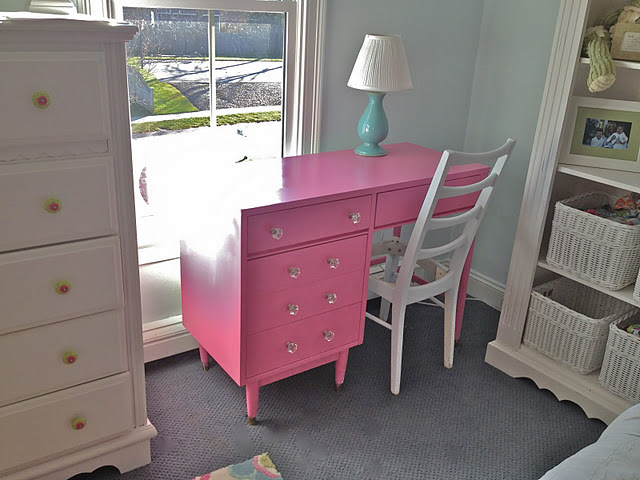 Next, Conspicuous Style shared an adorable freebie desk makeover. Love the story behind this as well. Too funny! Finally, I'm always on the lookout for great neighbor gifts. I loved this take on the ever-popular cookie-in-a-jar by Sense and Simplicity. Too cute. 1. Please link directly to your post and not just to your blog. 3. Please visit other participants and leave them comments! Help them feel "the love!" And don't forget to "like" your favorite posts so they can become the "FAN FAVORITE!" ooh i love that pink desk! Hi Wendy! I'm gob-smacked over those Nut Crackers! Holy Mackeroleos! Thanks so much for the party. I added my DIY Mod Aluminum Wreath to kick off this December! Thanks so much for hosting a party! Hi, Wendy. Your party is so festive this week! I shared a sautéed mushrooms recipe, a moist pumpkin bread recipe, and a Shrimp Santorini recipe today. Thank you for hosting us again and have a great week! Thanks for hosting. The Nutcrackers you featured are really cool! And the pink of the desk is close to my favorite Krylon color :). Wendy, thank you for hosting! Thank you for hosting! I'm loving all these Christmas crafts! Thank you for hostiing! I'd love for you and your readers to join us at Cap Creations every Friday for our thrifty link up. Hi Wendy! New follower here linking up for the first time :) Thank you for hosting and hope you have a great weekend! Hi Wendy, thank you for hosting! And what a party - so many entries!! Awesome! Have a great weekend! Can't wait to check out many of these wonderful links. Thanks for hosting this week. Um... I had not actually thought about how many days were left until Christmas. Thanks for the mini panic attack! 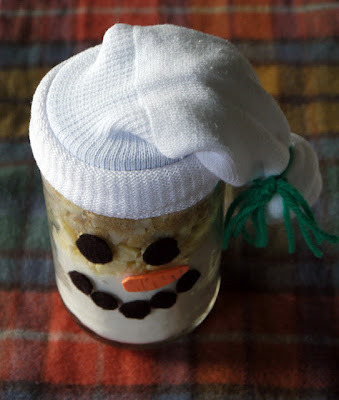 Thanks for featuring my snowman cookie mix jars - I'm pleased as punch that you did! Indeed I love the idea. Your site has a lot of Christmas items to choose from. Goodbye ebay! I am loving the pink desk from Conspicuous Style. I never would have picked that color, thinking it would be to bubble gum, too pink, and eventually get obnoxious, but after seeing that pic, I think I might give it a try. Thanks for sharing.